Used Lead Acid Battery Regulations – W.A. 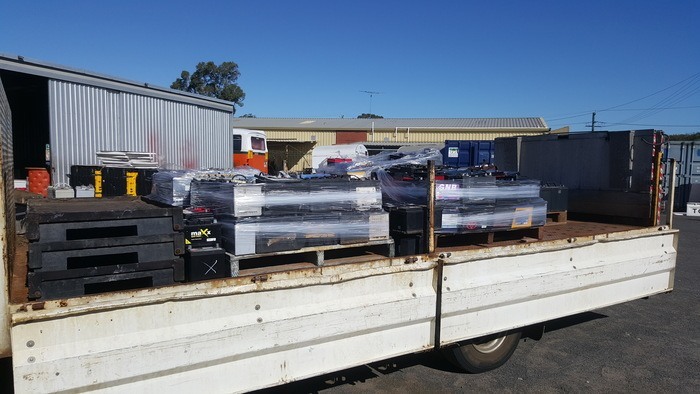 As a Controlled Hazardous Waste and Dangerous Good, used lead acid batteries (ULAB) must be stored, handled and transported in accordance with a range of Western Australian and Federal regulations. Many companies are unaware of all the regulatory requirements controlling used batteries and the “Chain of Responsibility” laws which can make Companies and its Executives liable. The cited regulations apply to both new & used lead acid batteries, except for the Controlled Waste requirements that apply to used batteries only. For more detail on the used battery regulations please refer to the “WA Battery Regulations Links” section below. For a more general overview of Australian regulations controlling new & used lead acid batteries, click here. What Are The Packaging Requirements For Lead Acid Batteries (New & Used)? 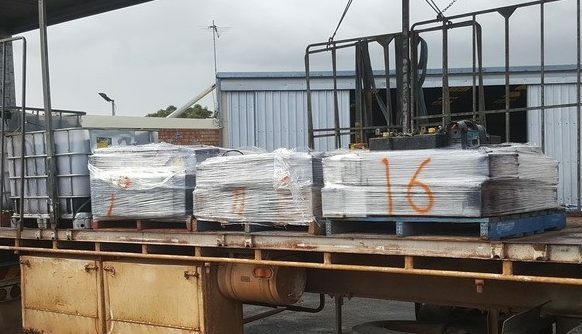 As a Dangerous Good, the transportation of Used Lead Acid Batteries by either road or rail within Australia is regulated by the “Australian Code for the transportation of Dangerous Goods (ADG Code)”. The Packaging Requirements for new and used lead acid batteries are contained in the ADG Code’s P801 Packing Instruction. 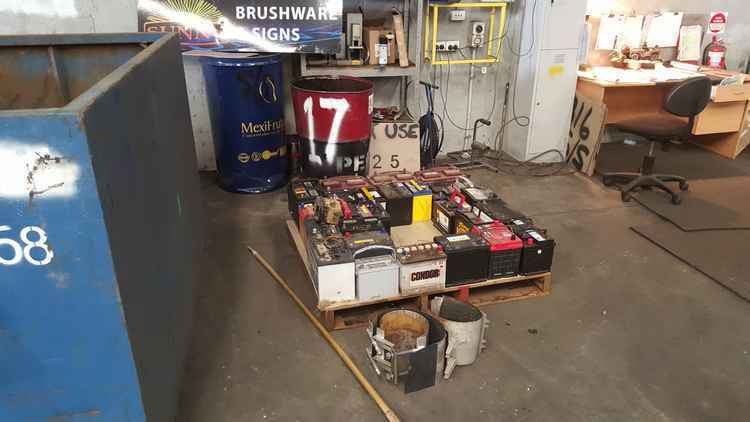 The Australian Battery Recycling Initiative published the following “Guidance for packing used lead acid batteries for recycling“, in 2017 which is recommended best practices, when using wood pallets to transport used batteries. The P801 Packing Instruction is being reviewed by the UN Committee for Dangerous Goods in December 2017, with the view to clarify some ambiguity in the current wording. These changes if passed will possible be updated in future versions of the ADG Code. Under the “WA Environmental Protection (Unauthorised Discharges) Regulations 2004” it is an offence to allow acids to discharge into the environment. Your Used Lead Acid Batteries should be stored in a bunded area (or device) and undercover to prevent the occurrence of an unauthorised discharge event. 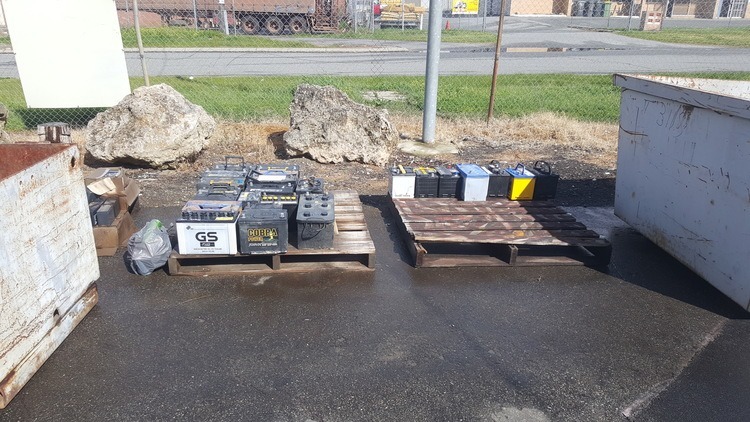 As per the “WA Dangerous Goods Safety (Storage and Handling of Non-explosives) Regulations 2007”, used batteries must be segregated from other incompatible dangerous goods and the batteries should be protected from impact. Failing to use a suitable, approved container, or transporting batteries loose in a vehicle. Using an approved container, such as wood pallet, but failing to wrap, strap and apply the appropriate DG signage. Note if a wood pallet is being used a 30mm, non conductive separator must be inserted between each layer of batteries. 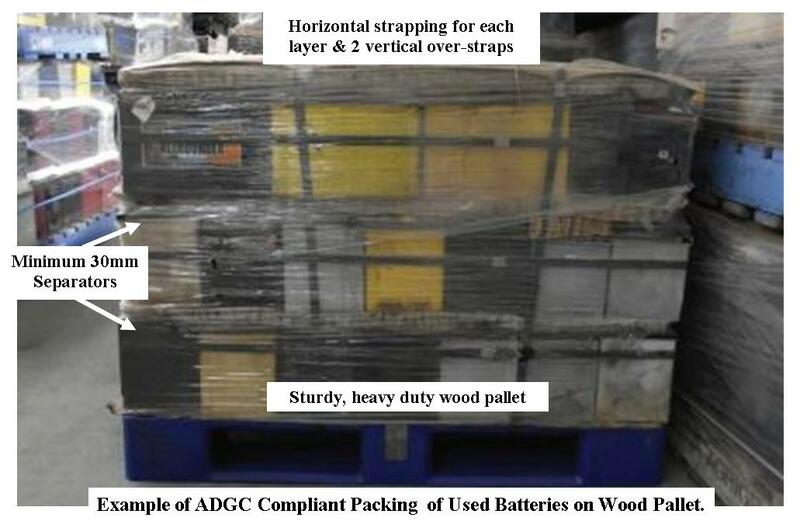 This ensure that the packaging provisions in the Australian Code for the transportation of Dangerous Goods (ADG Code), “Battery terminals shall not support the weight of other superimposed elements” and “Batteries stacked shall be adequately secured in tiers separated by a layer of non conductive material”, are met. No restraint of “placard load” (i.e. pallets) to the vehicle. The Battery Transporter doesn’t have the necessary Controlled Waste Carrier License. The introduction of the “Chain Of Responsibility” provisions into the WA Road Transport Laws means that Companies and their Executives can be deemed liable, if they are unable to demonstrate that they have taken all reasonable steps to prevent a breach. 1. “Australian Code for the transportation of Dangerous Goods By Road and Rail, edition 7.5” (ADG Code). The WA Department of Mines & Petroleum are responsible for administering the ADG Code. See Chapter 4.1.4 for a list of Packing Instructions including P801 for batteries, Chapter 5.2 for Marking & Labeling requirements for Packages, Chapter 5.3 Placarding and Marking of Transport Units and Part 8 for Stowage & Restraint requirements. 2. “WA Dangerous Goods Safety (Road and Rail Transport of Non-explosives) Regulations 2007” which among other things, gives effect to the standards, requirements and procedures of the ADG Code as to how they apply to the transport of dangerous goods by road or rail in Western Australia. Administered by the WA Department of Mines & Petroleum. 3. “WA Road Traffic (Vehicles) Act 2012” and “Chain of Responsibility” provisions for WA Transport Laws. Administered by WA Main Roads. 4. “WA Dangerous Goods Safety (Storage and Handling of Non-explosives) Regulations 2007”. Administered by the Department Of Mines & Petroleum. 5. “WA Environmental Protection (Controlled Waste) Regulations 2004” regulates the storage and transportation of Hazardous Waste and is administered by the Department of Environmental Regulations. 6. “WA Environmental Protection (Unauthorised Discharge) Regulations 2004” regulates the discharge of hazardous substances into the environment. The regulations are administered by local government councils. 7. “WA Occupational Safety and Health Regulations 1996” which cover used battery related safety issues such as “Risk from exposure to hazardous substances” and “Manual Handling”. The “WA OSH Regulations” are regulated by WorkSafe WA. 8. Australian Standard for Storing & Handling Corrosives 3780:2008 – This publication can be purchased from a number of online providers. Section 2 deals with provisions for Minor Storage, which applies if the combined volume of acid contained by the batteries is less than 1000L. 9. Century Batteries, Material Data Handling Sheet for Lead Acid Batteries. The Australian Battery Recycling Initiative (ABRI) has been formed by a group of battery manufacturers, recyclers, retailers, government bodies and environment groups to promote the collection, recycling and safe disposal of all batteries in Australia.